There’s a popular misconception that cats use their whiskers for balance, but whiskers actually serve other purposes. The average cat has approximately 12 long whiskers (technically known as vibrissae) in 4 horizontal rows on each side of her face, near her nose. A few shorter bristly whiskers may also be found over the eyes and on the cheeks, chin, jawline, and elbows. Whiskers are thicker than regular fur and have very deep roots. A cat’s whiskers are used for navigation and hunting. At the base of each whisker, in the follicle, there is a blood-filled capsule. The blood in this sinus behaves like hydraulic fluid, amplifying signals sent by the sensory nerves that surround it. Whiskers are exquisitely sensitive not only to objects they come into contact with, but also to air pressure changes. When walking, particularly in the dark, a cat tends to fan her whiskers forward to gather information about the terrain. The ability to detect shifts in air currents provides early warning of nearby obstacles. The cat can move her upper 2 rows of whiskers independently of the other rows so as to precisely gauge potential obstructions. She can also use her whiskers to determine whether or not she can fit through a small space. Cats usually hunt at night, and their whiskers help them identify solid objects without actually touching them. An air current caused by moving prey enables the cat to locate the small animals and react, as well as to accurately deliver the killing neck bite. Researchers have found that even a blindfolded cat can catch mice and kill them cleanly using her whiskers for guidance. If a cat loses her whiskers, her night hunting ability may be impaired. She may misjudge her killing bite, targeting the wrong spot on the prey, and thus be unable to kill cleanly in the dark. A cat’s whiskers move forward when she is curious about something or attempting to threaten another animal. When she feels defensive or is trying to avoid something, she will hold them back against her face. Cutting a cat’s whiskers is like removing an additional sense. Not only does it impair the cat’s navigational abilities, but it may cause unnecessary suffering to any prey she hunts, as she will have difficulty making a quicker, cleaner kill. There are breeds such as the nearly hairless Sphynx that naturally have short whiskers or no whiskers at all. 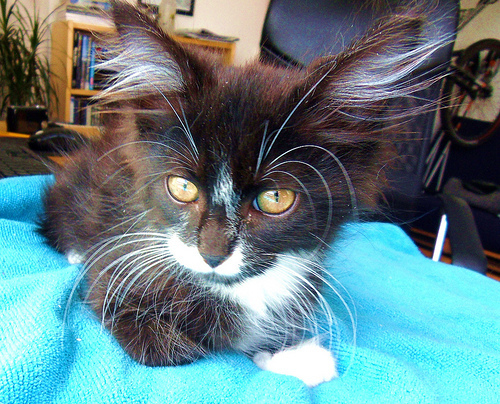 Rex cats, which have short curly fur, also tend to have curly whiskers that break easily. Sometimes mother cats chew off kittens’ whiskers. Several highly implausible theories have been proposed to explain this, such as the mother cat removing whiskers to punish her kittens. The most likely explanation for whisker removal is overzealous grooming whereby the mother accidentally takes off the whiskers while she is cleaning them. Kittens may also chew on their siblings’ whiskers or break them off when playing. Lopez, Thomas, DVM. (n.d.). “Cat Whiskers.” Gemini Farm: Rescue Rehabilitation and Adoption for Domestic Pets and Farm Animals in Need. Seidensticker, John, & Lumpkin, Susan. (2006). Cats: Smithsonian Q&A: The Ultimate Question and Answer Book. Washington, DC: Smithsonian Books.